It has been a busy year since my late update this past Fall. If you really would like to keep up with Pine Street on a more current basis, please see my Facebook company page at: www.facebook.com/Pinestreetstudios. The design complements a series of 10 lunette reliefs by George Nista depicting the history of the two families. Bottom left: Prior to start of work. The Heritage Center at the Union League, Philadelphia, PA.
Family Room with trompe tufted walls and decorated ceiling and mantel. Here's my video documenting the painting of a mural for an historic home in Philadelphia. It is new work for a residence designed by Frank Furness in 1895. It is placed high in the great room just under a large leaded glass skylight. Thanks to Barbara Eberlein for hiring me for this project and guiding the design direction. It has been nearly a year since I have added news to this web site. I have been busy painting and have been adding news to my Facebook Pine Street Studios, Inc. page. Now I will add photos of many projects here that I have completed over the past year. It is by no means a complete summary of all the aspects of the latest work and in fact does not include several projects. I think it will give an idea of what I have been up to this past year. A mention too that I will be back at the Rufus Porter Museum teaching painting workshops once again next month. Above L to R: A small powder room in a country house; decorated elevator doors in a high rise apartment; and my own foyer with ornamental plaster ceiling picked out in 11 colors, then antiqued, wood grained trim with hand painted leafy trompe l'oeil boarded walls. Above: A decorated ceiling w/ 2 detail photos of an 1895 Philadelphia residence designed by Frank Furness. A small powder room with harlequin design and silver leaf. A trompe l'oeil canvas placed high in a foyer which includes a great blue heron. Once again this Summer for the third consecutive year Hugh taught class at the Rufus Porter Museum in Bridgton, ME. A new class, "Early American Brush Stroke Wall Painting," had seven students who practiced brushstrokes, and then designed and painted their own large wall sample boards. This year's Vinegar graining class had twelve students, and each year the student work improves. Nell Ely was my assistant in the Wall class and boy, did I need it, as I had put together the whole thing while there at the Museum last week. The past several weeks have been filled with delays, technical problems and the need to fill in with fun little jobs. The first was a room (at left) that was first painted by Hugh 25 years ago as a 5-year-old boy's room. The room has now gone through three transitions, this time now as a guest room with florals. While experiencing a delay at a prominent Rittenhouse Square condominium complex when painting borders on new hardwood floors (see the continuation below), I had a few days to marble a couple of columns (at right) on an old mantel in another condo in the same building. For fun, I include a photo of the Square (at left) from the window. Below, I show a sample for the gallery floor and a couple progress pictures for the living room floor. The mural part of this project is finally finished, even through a bad cold with lost days, a big sciatica flareup and a tax audit to worry about! The client has continued with her cherub theme in her formal dining room. With the client's help, along with Andy Neylan (the cabinetmaker/builder) and myself, the shape of the Angel panel was created. The putti were all to be chubby baby boys with cute faces who were frolicking with fabric and pearls. I used the bodies of the cherubs from Francois Boucher and explored the internet for the cutest baby faces I could find. Here is a little project I have been working on since Thanksgiving. Once again I didn't want anyone to think I have been goofing off. The client supplied me with the reference. The Cultural Heritage Series class schedules at the Rufus Porter Museum in Maine are now posted on the museum website. I am teaching Country Vinegar graining once again, along with a new class entitled "Early American Brush Stroke Wall Painting." 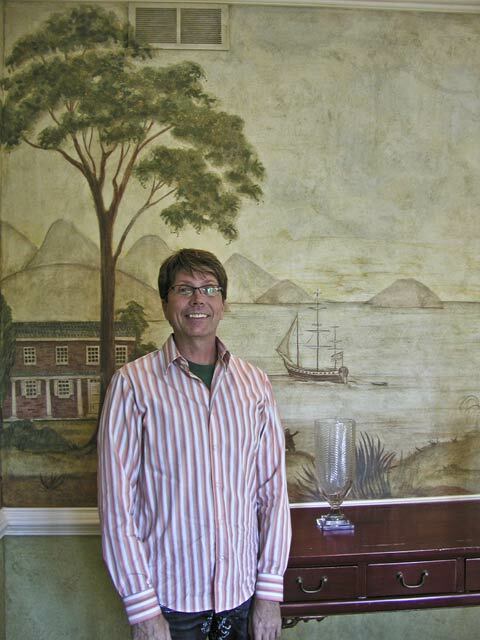 Veteran decorative painter and faux finisher Hugh Luck was brought in to carry the stately antiqued theme throughout the home's woodwork and ceilings. In the living room he painted the ceiling a serene ivory with a pale blue-green border (it's adorned with a lacy plasterwork medallion) and layered several coats of acrylic watercolor glazes on the walls for a distinctive green finish. Luck gave the dining room's meticulously rendered plaster-embellished ceiling an equally precise paint job, and amped up the trim with antiqued gold leaf. His trompe l'oeil details are standouts too: vent covers and switchplates blend in with wall treatments. Luck primarily works by himself and is known for his sprawling custom murals, decorative panels and architectural finishes that are doppelgangers for marble and stone. "Our job is to give the clients what they want — and to give them things they have never even dreamed of," says Eberlein. "Hugh does the same thing when he paints." More photos of this project can be found in the PROJECTS, under Faux Finishes: Antiqued Plaster Living Room. Just in the nick of time prior to Thanksgiving eight canvases were installed in a beautiful residential ballroom in Moorestown. This room was painted and glazed by Pine Street over ten years ago and now has some period French-style decoration. The designs are "trophys" of musical instruments and flowers suspended from ribbons. Four are just the knotted ribbons and four include a swag and tassel theme. All are antiqued. Both antique and some modern craft instruments are included in the designs. This month I was lucky enough to get a nice writeup in South Jersey Magazine. I tell my friends the propaganda will be difficult to live up to. They included these two photos in the layout and on the continuation you may read it for yourself. Thanks to Barbara Omert and Nancy Rice for offering to be interviewed by Lorraine Gennaro and speaking well of me. Due to lots of work, travel, and fun, it has been a while since I updated my blog. I don't want anyone to think I haven't been at work. Since August I have painted a couple of floral panels on canvas and installed them in a favorite client's home foyer in Moorestown, NJ. Since then I've returned to paint a ceiling medallion in the same foyer and as of today (Oct. 24) I am just about done. Just prior to this I worked in New York City in a fabulous mid-19th century brownstone in Chelsea where I glazed the bedroom walls with three layers of camel to chocolate brown. It was a rather ordinary finish in an extraordinary room. I did have time while allowing paint to dry to visit the Metropolitan, Folk Art and Museum of Modern Art museums. Plus I saw the plays "Equus"and "Spam a Lot" and actually met Clay Aiken and Daniel Radcliffe briefly...not to mention running across Sandra Bernhart in the local bookshop. I include a few shots of the work I've just mentioned. I am also lucky enough to have a feature profile in next month's South Jersey magazine to look forward to. Here is a project I have looked forward to starting for quite some time. This is an 11' by 19' tray ceiling in a home lower-level entertainment and game room. The tray will rest above an original 1940's French Art Moderne billiard table. The entire area boasts custom-milled cherry paneling. The fun thing about the tray is the design: an art modern or perhaps more of a Russian constructivist motif. The challenge is that it will be rendered primarily in metal leaf: sterling silver with 23kt. Palladium gold (very bright silver like) along with colored tinted versions of the varnished silver leaf with some paint colors as well for accents. After exploring ideas for several months I drew the final pencil sketch this past Monday (8-4-08) and on Tuesday laid the design out on the ceiling. 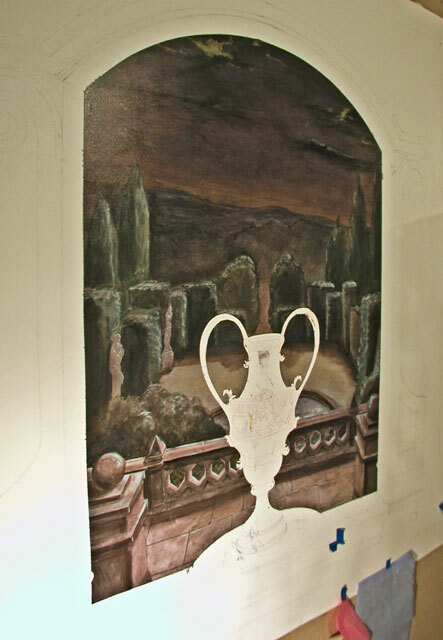 Today taping for the first layer and sizing for the bulk of the background silver was accomplished. Tomorrow the laying of the silver leaf begins. Quick preliminary color samples and the sketch are shown. During the past several months this year I have painted many jobs which haven't made it on the site. I thought it might be nice to include many of these here as well as in the near future add any new smaller projects to the list. Some are just little things like matching a thermostat to the wallpaper, others are fun decorations on vanities. Here you will find floral decoration in a kitchen, trompe l'oeil panels on foyer doors, neoclassical decoration on dark walnut paneled doors in a great master bath, a step stool, an armoire (courtesy of Kirsten Doyle) and the list just goes on... look for your job here! This month's biggest project is a master bedroom ceiling in a lovely Moorestown, NJ home with designer Arnie Liguori. The clients had seen the "Breakfast Room Ceiling" from the projects page and asked for something with a similar flavor. The shape of the tray ceiling with arch moulding was almost the same as in the prior work painted over 8 years before. My job was to design something a bit different architecturally. At this writing I am about half way through the process with rendering of the architectural elements underway. This past week (the week of July 7) Hugh was once again happy to be invited to teach classes at the Rufus Porter Museum in Bridgton, Maine. Vinegar wood graining and antique finishes were the topics. The list of guest teachers was much greater this year and Hugh was honored to be included with notables such as Ron Bourgeault (guest speaker), Linda Lefko, Sandy Howe and many others. Nelle Ely acted as Hugh's assistant for all three classes. This Spring I have the opportunity to paint a little girls' room in a fabulous setting: a Philadelphia penthouse with a splendid view. Although not quite finished the birch trees and critters requested by the designer Kate Swope, a.k.a. "Kate in Montana" have the soft feel and friendly animals that Kate felt the new occupant would love. The walls and ceilings are water color washed in sky tones from above down into yellows, pinks and greens to give a soft focus effect of a woodsy background. Birches line the corners of the room where critters are at every turn: two does, a "raccoon daddy and baby", mama and baby foxes, squirrels, hedgehogs in a nest, four owls perching, many birds, butterflies and a strategically placed dragonfly. Once all the painting is complete and the great furnishings (birch Adirondack style) are placed, if I can get better photos I will place them in the archives under "Kid's Rooms". Pine Street Studios was awarded with an honorable mention in 2007 and again now in 2008 by American Painting Contractor magazine in their first and second publishings of "Who's Who in in the Painting Industry 2007 / 2008." Only twelve decorative painting contractors from throughout the United States were mentioned in the article. In their 85th year this publication is the most recognized trade magazine in the painting industry which by the way is not allied with any manufacturer. In 2004 Pine Street was featured in American Painting Contractor's Top Job Awards with an honorable mention (basically sharing second place with two other contractors in the decorative painting category) for this stencilled coffered ceiling. "Spectacular Homes of Greater Philadelphia" was published in 2006 by Panache Partners LLC. Pine Street was represented in the work of several designers including Mary Ann Kleschick. Work for Mary Ann included a master bathroom suite in Moorestown, NJ, complete with a Tuscan mural over the tub and a Venice inspired dome in the dressing area. 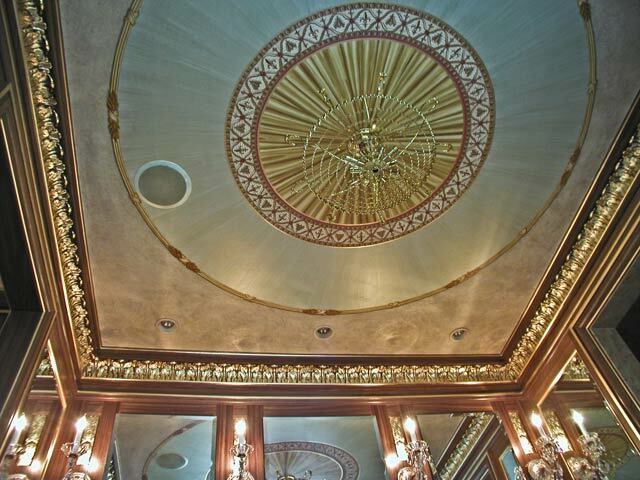 Another project features a penthouse condominium in New Hope, PA, with a silver/gold leafed dining room ceiling. Other photos of these projects appear in the archives of this web site. For Bennett and Judie Weinstock (with Joanne Hudson Associates) the elaborate coffered kitchen ceiling (Kass and Associates, architects) was antiqued to match the Hudson Cabinetry. This is a great book for fans of Philadelphia designers, with work contributed by as many as 47 area designers and architects. Other designers represented for whom I work from time to time (but not any Pine Street work shown in the book) are Creg Oosterhouse, Barbara Eberline and John Rolland. While painting a master bedroom suite for another of my favorite Moorestown, NJ, clients, there was work which included 23kt. 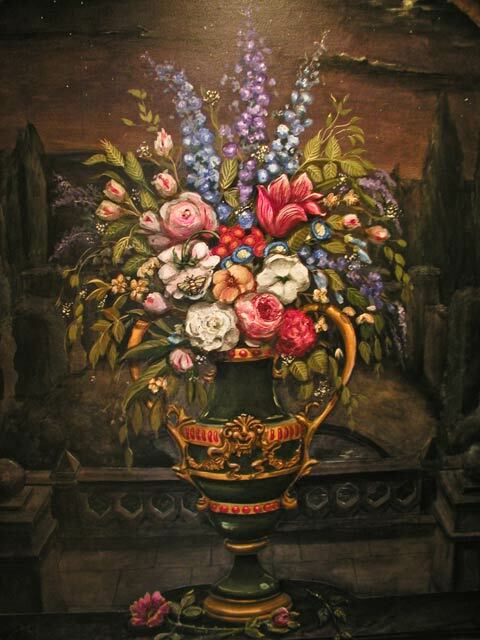 gilding, faux bois, antiquing, a decorative bath ceiling and this floral still life for the water closet, both painted on canvas in the studio. The progress photos of the floral and the finished decorated ceiling have been placed in different sections in order to feature the process used in painting the floral (which was set in a trompe l'oeil window). Canvases were also prepared for the other walls and dado. The complete (both in-progress and finished) "Floral Still Life" photo set, with captions explaining the process, resides in the Projects archive in the Wall Murals section. The ceiling photos can be found in the Decorated Ceilings archive, beginning with Master Bath: Faux Fabric Ceiling. A favorite Pine Street client was featured in Design NJ magazine last April 2006. Published were six rooms that we painted including the family room with a gothic inspired stencilled coffered ceiling. The billiard room displayed a color washed ceiling with trompe l'oeil medallion and stenciled border. A detailed photo of the medallion is on the home page slideshow. The windows and doors were all woodgrained to match the cherry cabinetry. The Teen daughter's room was watercolored in a graded wash with stenciled funky 1960's flowers. The daughter enjoyed helping with the stenciling as she is a fabulous artist in her own right. A detail of the stenciled coffered ceiling is at the left. This Summer Hugh is once again happy to be invited to teach classes at the Rufus Porter Museum in Bridgton, Maine. Vinegar wood graining and antique finishes are the topics of the short 4 hour hands on classes. The list of guest teachers is much greater this year and Hugh is honored to be included with notables such as Ron Bourgeault, Linda Lefko, Sandy Howe and his dear friend Nelle Ely among many others. February 13 Update: The vinegar graining class is filled for next Summer and the Antiquing class is now half full. (My classes are limited to 10 students for each class).